Elizabeth "Beth" Kimberly Tweddle MBE (born 1 April 1985) is a retired British gymnast. She is the most successful British gymnast, male or female, in the history of the sport. She was the first female gymnast from Great Britain to win a medal at the European Championships, World Championships, and Olympic Games. Tweddle is a three-time Olympian. She is the 2012 Olympic bronze medalist on uneven bars. Tweddle is also the 2006 World uneven bars champion, the 2009 World floor exercise champion, and the 2010 World uneven bars champion. Tweddle retired in August 2013. Tweddle was born in Johannesburg, South Africa. She moved to Bunbury, Cheshire at 18 months old. 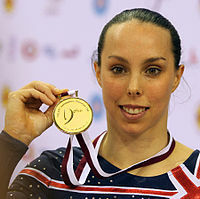 ↑ "Olympic medallist Beth Tweddle announces retirement". BBC Sport. 6 August 2013. Retrieved 13 March 2015.